Postseason awards are great. We dabble in them, and they are a big part of many professional contracts. Many of us can recite the 2005 NFL MVP (Shaun Alexander), while few can recall who and what led the NFC in passing touchdowns that season (Drew Brees, Jake Delhomme, Matt Hasselbeck and Eli Manning, with… 24. Twenty-four!). Awards also tell us a lot about our collective understanding of the game – what we as media value versus what is truly valuable in the game of football. We often confuse things like gracefulness and toughness with results, using impressiveness as a proxy for value. You reap what you reward, and one could argue that it’s taken the league this long to (almost) appreciate the full effects of the passing game because of the way we’ve glorified running backs historically. Take, for example, the Most Valuable Player award. If the term “valuable” is attached to this award, there is no universe where a position other than quarterback should ever win the award in today’s NFL. Using our wins above replacement (WAR) metric from 2017, a down year for passing in the NFL, the top-10 players on the list were all quarterbacks. That’s right, the 10th-best quarterback, who is underneath the 70th percentile of starters at the position, is more valuable than the best player at any other position. This has been mostly true during the PFF era (2006 – present). Despite this truth, there has been a backlash, possibly in response to an increase in the prevalence of analytics, that has Los Angeles Rams running back Todd Gurley firmly in the conversation for the NFL MVP. His numbers have been great, as he’s on pace for 1,543 rushing yards, with another 644 yards through the air and over 28 touchdowns. However, as we’ve discussed many times on the PFF Forecast, Josh Hermsmeyer laid out brilliantly on fivethirtyeight.com and many independent threads on Twitter will show, running back rushing statistics are mostly a product of the offenses in which the back plays. Gurley is a prime example of this, as he failed to crack 900 rushing yards while he was behind the 29th-best run-blocking offensive line in 2016, but he’s putting together this gem of a season with the league’s top-graded unit in 2018. The correlation between pass-blocking grades and quarterback performance is far less substantial, and while receivers, cornerbacks and pass-rushers all depend upon those around them, they are still far more important to a team over a replacement player. The league MVP so far is your favorite between Patrick Mahomes and Drew Brees. Using our WAR metric, the most valuable non-quarterbacks through nine weeks have been Adam Thielen, DeAndre Hopkins, Aaron Donald and Michael Thomas, which shows that you either need to be on the supporting side of a quarterback’s productivity or be an outlier situation in terms of stopping it to even warrant a mention in this conversation. Be that as it may, there’s a secondary question to ask: Is Todd Gurley the most-valuable running back in the NFL, or are there other players that have a claim to this spot? Running the football, even as well as the Rams do it, is not nearly as valuable as throwing the ball, and backs that can make substantial dents in the opposing defense as receivers will be a big part of this conversation for us. As such, the most valuable running back in the NFL to this point is none other than James White of the Patriots, with his WAR ringing in at 30th in the NFL through nine weeks. James White is my kind of running back. His Pro Football Reference page lists his receiving stats before it lists his rushing stats. He was drafted in the fourth round out of Wisconsin, where he was often overshadowed by players like Montee Ball and Melvin Gordon. However, it’s in his role as a receiver that he has shined on a New England offense that has spent many weeks without players like Rob Gronkowski, Julian Edelman, Josh Gordon, Rex Burkhead, Jeremy Hill, and Sony Michel. Tom Brady hasn’t really been himself, either, grading out as only the seventh-best quarterback in the league. Despite all of this, the Patriots are 7-2 and are averaging 30 points per game (fourth). White has turned 260 routes, the most among running backs, into 531 receiving yards (also most) on 77 targets – good for over two yards per route run, an efficiency that is difficult to maintain under such volume. His 478 yards after the catch are both second to Saquon Barkley and demonstrate that he’s making some of his plays downfield, with an aDOT roughly two yards better than Gurley (with half as many drops). He’s generated over 50 yards receiving in all but two Patriots games, and he’s scored at least one receiving touchdown in five games. He’s earned 10 more first downs through the air than any other running back so far, and he’s received a positive grade on 46% of his targets, which is also the best mark at his position. If running is your thing, White has added another 235 yards and four touchdowns on the ground– utilizing a Patriots offensive line that, while not grading nearly as well as Gurley’s Rams, has graded well in run-blocking through nine weeks. Running will not move the needle much – for example, the Rams have generated exactly 0.0 expected points added on early-down runs this year, but White, chipping in some in that department, coupled with his position-leading production in the passing game, make him a clear (if surprising) choice against Gurley. There’s a lot of football to be played, and players like Alvin Kamara, Kareem Hunt and Gurley will likely continue to do very impressive things in high-profile games. But for right now, it’s hard to argue that the differential in outcomes for the Saints, Rams and Chiefs offenses would be as large sans these players than it would be for the Patriots without White. 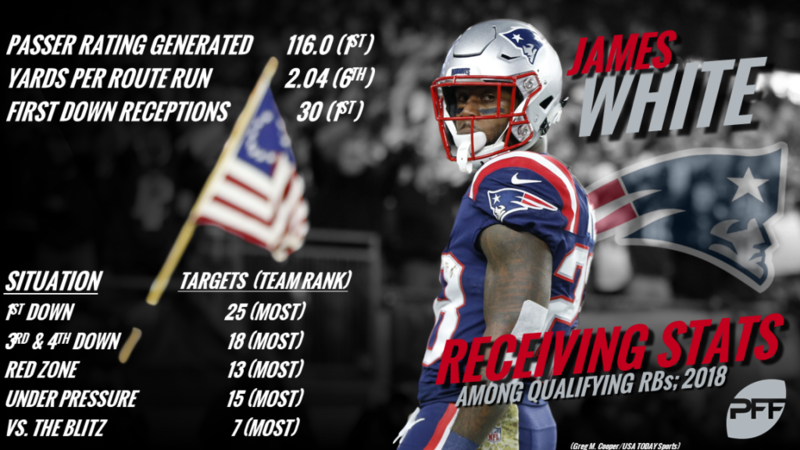 And for that, despite what is widely believed, James White has been the running back that has impacted his team the most through the season’s first nine weeks.